A German elderly couple , today 80 + 50 years old who have been Dubai Tourists since a decade, bought in 2005 an apartment at Nakheel´s Dubai Residential Falcon Tower located on Plot H3 Jumeirah Lake Towers. The completion of this Tower should be March 2008 but the apartment was never delivered and they end up in a Horror scenario when the development was transferred from Nakheel to DMCC and Al Fajer Properties Dubai in 2006. DMCC transferred the 45 % already paid installments paid once by the couple to Nakheel, in 2007 to Al Fajer Properties. Left in the illusion everything went fine, Al Fajer Properties start in 2008 to threat the couple to sign and agree to a new contract. This contract was given to the couple in November 2007 in form of a draft in presence of their lawyer and staff members of Al Fajer Properties. It was a blank document , containing only terms and conditions but not containing any Building constitution, no Apartment specification, no price, and no other relevant declarations. It was a draft with no specification. Within this draft Al Fajer themself was not named as developer, just as seller. The Tower on Plot H3 was quoted in the Header now as Mixed Use Building ( Residential/Commercial) and renamed to Jumeirah Business Centre 8. Several correspondence upon January 2008 sent to Al Fajer Properties to complete the relevant documentation failed. Al Fajer didn`t provide the relevant Documentation. March 2008 Al Fajer Properties appointed a new CEO and President, Maktoum Hasher Maktoum Juma Al Maktoum. Starting on March 10, 2008 the couple received threats to deprive them of the property and simply return the amount,unless they did not sign and agree to the incomplete blank draft contract. A letter wrote by the couple to Al Fajer Properties in June 2008, brought a reaction of Michael Kerr , a lawyer fron Denton Wilde Sapte ,namely instructed to do so by the CEO Maktoum Hasher Maktoum , showing the willingness to pay a full compensation based on the damage cause by Al Fajer Properties to the couple. The discussion was about the sum and damage caused by Al Fajer Properties , based upon the event to enable the couple to buy an adequate apartment. The market price of such an apartment was at that time over 2 Million AED. But finally the so called good will of Maktoum Hasher Maktoum Juma Al Maktoum end up in further threats by Al Fajer Properties upon a statement October 2008, by not taking the now offered amount, to return only the amount of the once paid 45%. ( 345.000 AED). Within this letter the couple has also been threatened that they contacted in April 2008 a Journalist by providing this Journalist their nightmare story , and that they will get in further trouble if they made the story public in the future. After this threat Al Fajer Properties choose the way to remain silence. No more correspondence sent to Al Fajer Properties or their lawyer were answered by them after January 2009. Later it was revealed by the couple , over a document provided to a foreign court, that Al Fajer Properties CEO Maktoum Hasher Maktoum Juma Al Maktoum sold on March 31, 2008 the Tower Plot H3 Jumeirah Lake Towers as a 100% Commercial Tower to Dynasty Zarooni . This document confirms, that the acts by Al Fajer Properties in March 2008 against the couple, have been misleading acts, that the was no intention by Al Fajer Properties to build a Residential Tower on Plot H3 or G3. This document uncovered why the couple have been mislead ,been left in the illusion of a now Mixed used Residential Tower. It confirms the reason of the unwillingness from Al Fajer Properties to provide the missing declaration and documentation of the building constitution within the draft contract, to which Al Fajer Properties extorted the couple several times to sign in March 2008 . The Tower however on Plot H3 Jumeirah Lake Towers , which was converted by Al Fajer in a Commercial Building in March 2008 ,renamed to Jumeirah Business Centre 8 , sold in March 2008 to Dynasty Zarooni ( here renamed again – now to Eboy and Ivory Towers) , is not completed until today. From 2010 until 2011 Al Fajer Properties was several times contacted directly via email and over an adress of a Lawyer who presented Maktoum Hasher. Within this correspondence Sheikh MaktoumHasher Maktoum has been asked several times to pay the outstanding debts to the couple. 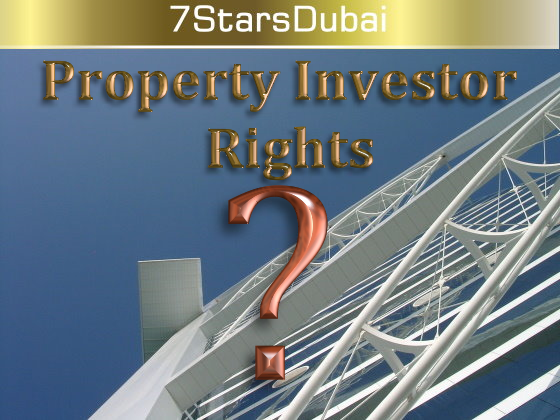 Upon today Al Fajer Properties resists to do so – they simple do not answer any correspondence. The lawyer was after this correspondence informed that a criminal complaint ( by providing him a copy of the complaint) was already filed against his client Makroum Hasher and that it is extremely remarkable, due to the evident correspondence of March 2008 until October 2008 from other lawyers of Al Fajer, that his client Maktoum Hasher Maktoum start now in 2010 to simulate not to be in the acknowledge that there was still a claim against Al Fajer Properties and him and that he cannot remember his acts when he threat them in March and October by saying just returning a refund of the paid installments to the couple. Sheikh Maktoum Hasher Maktoum upon today did not answer to further reminders sent to him and Al Fajer Properties in frequent rythm upon today, asking to pay the money back he owe the couple. He never delivered an apartment for the money nor did he ever build or intended to built the Residential Tower. Sheikh Maktoum Hasher Maktoum simply put the money of the couple in his pockets for delivery nothing. He committed a Fraud, mislead the couple ,did not pay back the money once paid by the couple, did not correct the damage he caused over a manner compensation. Consideration should be given to whether contracts yet to be entered into should specifically address these issues. But what if the decision is taken not to do so or an existing contract does not address damages? The Civil Code provides an entitlement to compensation for breach of contract even where the contract itself does not provide for such compensation. The purpose of damages is to compensate a party for any loss suffered as a result of default by counterparty to a contract. If damages for a breach of contract are not fixed under a provision of the law or in the contract itself, the Civil Code gives the court discretion to assess compensation “in an amount equivalent to the damage in fact suffered at the time of the occurrence”. The focus here is on the actual loss suffered by a party and gives the court a broad discretion to determine an appropriate award of damages on the basis of the facts and evidence before it. However, how is the ultimate determination made and what limits are imposed on the amount of compensation that may be awarded? Other provisions of the Civil Code that do not specifically relate to contractual damages may give some guidance as to how compensation may be assessed by a court: “In all cases the compensation shall be assessed on the basis of the amount of harm suffered by the victim, together with loss of profit, provided that it is the natural result of the harmful act”. The key element of this provision is that a party suffering loss will be compensated for that loss, including any loss of profit, which flows naturally from the default. The explanatory memorandum to the Civil Code says damages are payable in respect of the actual loss suffered as well as loss of expectation (that is loss of an opportunity to obtain a benefit under a contract or to avoid a loss). Each type of damages claimed will need to be substantiated and shown to result from the breach. Consequential (or indirect) losses will generally only be recoverable where it can be shown that the party causing the loss did so with a malicious intent. While it is important to keep in mind the award of damages is always at the court’s discretion, a specific damages regime in a contract can have the benefit of providing greater certainty as to a party’s right to contractual damages and can assist parties negotiate ways of avoiding recourse to court in this challenging environment. Nakheel former CEO Chris O’Donnell who left Nakheel last June after five years, has won a $3 million claim against the Dubai real estate developer for breach of contract, the Dubai World Tribunal ruled Thursday. Chris O’Donnell was awarded $ 3 million in bonus compensation in the judgement. Judge Anthony Evans made the award at the Dubai World Tribunal held at the DIFC Courts. Damac Properties Dubai must pay the Irish couple Noel and Lorna Gaffney compensation for failing to deliver their apartment in Dubai’s Park Towers on time the DIFC Court ruled. Gulf News reported, that the Court also criticised the company for using highly technical arguments and tactics as well as the casual manner in which it had approached the court proceedings — as a result, it ruled that Damac should pay the Gaffney’s Dh200,000 legal fees. As reported in The National the court awarded the Gaffneys Dh1,781,009 (US$484,872), representing a refund of payments they made towards apartment 602 in Tower B of the development. The Gaffneys bought their Park Towers apartment off-plan in 2004, according to their original claim. The project consists of two 49-storey cone-like glass buildings and is situated within the grounds of the DIFC, close to the financial district’s central Gate Building. Lawyers representing a German investor, Dr Lothar Ludwig Hardt, said the developer allegedly used the money from other property projects to construct Park Towers, the only development that appears to be ongoing out of the five that Hardt had signed up in February 2007. “These close links show the other four properties are connected to Park Towers… which should have been finished two years ago,” Ludmila Yamalova, legal consultant and partner at Al Sayyah Advocates and Legal Consultants, told Emirates Business. She said Hardt has invested $9.7 million on five properties which, in addition to Park Towers include the two cancelled projects – Lotus Residences and Wildflower; Ocean Heights, which was scheduled for completion eight months ago; and Water’s Edge, where construction hasn’t been started yet. The German investor is thus demanding refund of $9.7m and is seeking damages and lost profits caused by the developers’ breach of contract and other violations of the UAE, Dubai and DIFC Courts. Yamalova estimates that damages, loss of profits plus all the legal fees could go up to $140m. “As of today, defendants have not delivered any of the properties and have not complied with any of the contractual obligations to claimants,” a claim form seen by Emirates Business said. “Defendants have committed a series of violations of UAE, Dubai and DIFC Laws in connection with properties such as enticement and unfairness, illegal sale, failure to obtain necessary approvals, failure to commence construction timely, failure to timely register developer and obtain necessary license, mismanagement of escrow funds and violation of trust account regulations, unfair contracts of adhesion, fraud and deception… illegal competition, bribery, trickery, breach of trust, cheating in commercial transactions, money laundering and accomplice liability,” said the claim form. Two property developers and a real estate promoter have been ordered to repay Dh1.77 million paid in by a couple for a 26th-floor-flat overlooking Dubai’s Business Bay. The Dubai Real Estate Court ordered the Dubai-based promoter and property developers to repay the couple, a businessman and his wife, Dh1.77 million which they had deposited as a first instalment for the flat in a high-rise tower project. Lawyer Dr Habib Al Mulla, of Habib Al Mulla and Co Advocates and Legal Consultants, who represents the couple, lodged the civil lawsuit against the defendants after they refused to collect the remaining instalments and write a contract then deliver the flat. Presiding Judge Shehab Ahmad Al Shehi also ordered the defendants to pay the above-mentioned amount plus nine per cent legal interest. Dr Al Mulla said since the deal was made, it was his clients’ first encounter with the Dubai-based property developer. “The claimants asked the promoter why should they pay the second payment to the Dubai-based developer before, they later agreed to pay & surprisingly, the promoter informed my clients that they stopped receiving payments for that project,” he continued. He said his clients were asked to follow up with the Dubai-based developer and a Kuwait-based developer. The Dubai-based developer met with the claimants and informed them that there were no problems and they would be collecting their contract within a week, according to the lawsuit. “Since then, the plaintiffs had been avoiding the claimants, refused to collect any instalments and didn’t process the contract. Since my clients didn’t get the flat, the price of which tripled after sometime, they lodged this lawsuit and claimed Dh1.77 million plus Dh500,000 in financial and moral compensation for the damages they incurred by the plaintiffs’ act,” argued Dr Al Mulla. Presiding Judge Al Shehi further ordered the plaintiffs to pay Dh3,000 in lawyers’ fees. The primary verdict is still subject to appeal. German investor Lothar Hardt is suing Damac Properties for alleged breach of contract in what could be the largest lawsuit taken by an individual against a Dubai developer. Lothar Hardt has filed his case against one of the region’s biggest developers and four of its executives at the Dubai International Financial Centre Courts. Mr Hardt claims to have invested US$9.7 million (Dh35.6m) across five of Damac’s developments in Dubai, including one building on land he says is owned by the UN. The dispute relates to a series of off-plan investments made since 2006 in projects including: Park Towers at DIFC; Water’s Edge and Lotus Residences at Business Bay; Wildflower at Jumeirah Golf Estates; and Ocean Heights at Dubai Marina. Mr Hardt alleges the developer failed to deliver the projects on time, mismanaged escrow accounts relating to some of the projects and did not register the transactions with Dubai’s Land Department, court documents show. Damac is also accused of selling property in Water’s Edge, Lotus Residences and Wildflower to Mr Hardt without owning the land or obtaining construction permits. The land on which Lotus Residences is planned is owned by the UN, the court documents claim. 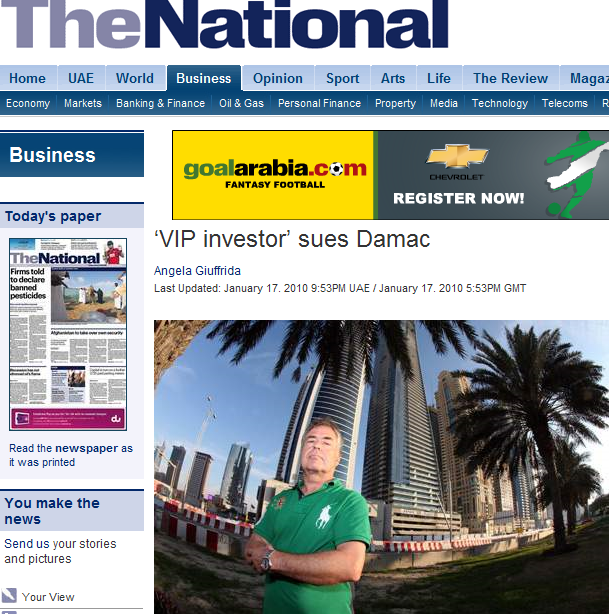 Mr Hardt, considered one of Damac’s “VIP investors”, is also suing for additional loss of income after he claimed to have signed agreements with retail outlets that were going to rent the commercial units he bought from Damac. Now Mr Hardt is demanding a refund of the $9.7m he has invested in Damac projects, in addition to damages and lost profits. Damac has acknowledged the case against it and four of its executives: Hussain Sajwani, the company chairman; Faisal Sajwani; Sofyan Khatib; and Peter Riddoch, a former chief executive. But the company is contesting that the case be heard at DIFC, where it is registered and where one of the projects, Park Towers, is located. It has until February 4 to declare its reasons for contesting the DIFC’s jurisdiction, which follows English common law and, unlike the main Dubai courts system, allows foreign lawyers to represent clients and cases to be heard in English. Damac declined to comment yesterday. If all or part of the case takes place at DIFC, it will be the first major dispute against a property developer to be heard at the court since it was set up in 2004, said Ludmila Yamalova, a partner at Al Sayyah Advocates and Legal Consultants, which is pursuing the case on behalf of Mr Hardt. If Damac’s bid to have the case heard elsewhere is granted, then the rest of the dispute would have to go through the main Dubai courts system, which is more costly for complainants as they have to pay separately for each contract dispute, rather than take a class action. “Right now, investors think there is no justice or no recourse, but at DIFC we do have a world-class institution that can deal with these issues at an international level … this is what DIFC has aimed to represent,” added Ms Yamalova. DAMAC Properties has filed a motion to stop an investor’s lawsuit being heard in the Dubai International Financial Centre (DIFC) courts, and has also moved to strike the case entirely, the lawyer for the investor told 7DAYS yesterday. German investor Lothar Hardt, who has invested in around dhs100 million worth of properties from Damac, filed a suit against the firm in December with the DIFC Courts, alleging breaches of contracts in the form of delays, misrepresentation of properties, fraud and improper use of funds, among other claims. Hardt has invested in Lotus Residences and Water’s Edge in Business Bay, Park Towers at DIFC, Wildflower in Jumeirah Golf Estates and Ocean Heights in Dubai Marina. He filed the suit with the DIFC Courts because Park Towers is located at DIFC and Damac is a DIFC-listed company. Ludmila Yamalova, a partner at Al Sayyah Advocates and Legal Consultants, which is handling the suit, previously told 7DAYS that having the case heard at the DIFC Courts has a number of advantages over the Dubai Courts, including the fact that DIFC operates under British law, which has had more experience of property disputes in comparison with Dubai law. Yamalova said yesterday that Damac was contesting the jurisdiction of the case and was also moving to strike out the case due to a lack of “reasonable grounds”. However, she said Hardt had filed five motions in response to Damac, including a motion for judgement by default and an award of damages of over $132 million because Damac failed to support its motion with proper statements and failed to file its defence, and defences for individuals named in the case, on time. The requested damages include actual damages of about $44 million in lost profits and legal expenses, and punitive damages, which can be up to three times the value of actual damages in the DIFC Courts. 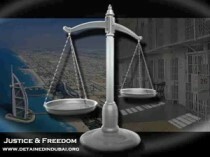 The motions of both Hardte and Damac will be heard at DIFC Courts later this month. Hardt told 7DAYS in January that if DIFC Courts decided jurisdiction belonged with the Dubai Courts, he would still pursue the suit. “First I am hoping that I will regain my money and the second thing is, while I have been negotiating with Damac I’ve seen so many people in the situation where all the money they had was in one apartment and they stand to lose it all… so I see myself also as being the spearhead for these people,” he said.